Working with a Spouse secretly on an Anniversary gift is so exciting. Recently I was contacted by a friend for a 30th Anniversary surprise…. Late 2017 my wife and I celebrated our 30th wedding anniversary. 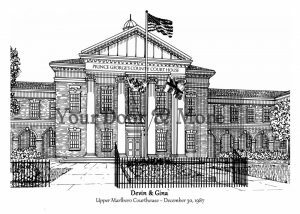 We commissioned Brenda to capture a place that signifies where it all began,our wedding location, the historic Courthouse in Upper Marlboro, MD. It turned out perfect! We love the way she captured a place that holds a very deep meaning to us. We highly recommend Brenda! Send me the address of that special location of your wedding, honeymoon getaway, reception location or first home and we can work together for a memorable and meaningful gift to your sweetie.